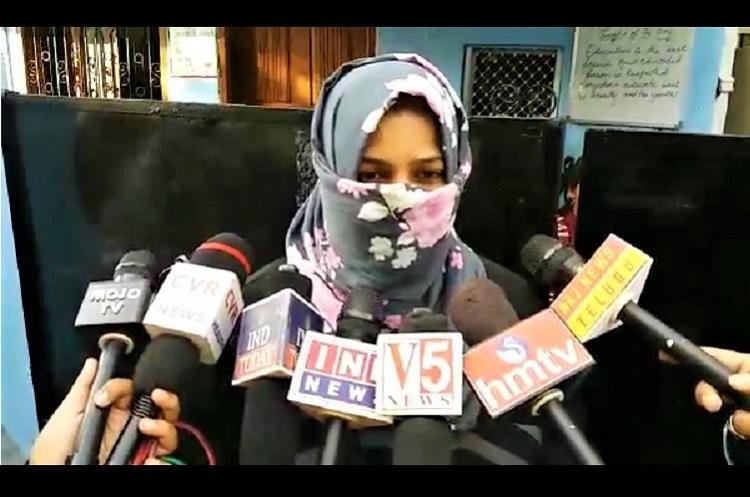 A woman in Hyderabad has alleged that she was given triple talaq by her husband over the phone after she gave birth to a baby girl, reports The News Minute. The incident, which took place in the city’s Tolichowki area around three weeks ago, came to light after the woman lodged a complaint with the police and approached the media. The accused, identified as Shareef, is said to be working as a principal in a school in Tolichowki area. Speaking to reporters, the woman said that she had been married for a little under 2 years, but her ordeal started a month into the marriage, when her husband started torturing her for dowry. Her mother-in-law also assaulted her physically and she was beaten even when pregnant. The harassment increased after she had a baby girl around 3 months ago. Mentally harassed to the point of depression, the woman’s parents brought her back home and even had to admit her to hospital. While she was at her parent’s home, her husband called and pronounces triple talaq over phone. Instant triple talaq or talaq-e-biddat is the Islamic practice of divorcing a woman by stating the word ‘talaq‘ thrice in quick succession via oral, written, or more recently, electronic form. The practise of instant triple Talaq was declared unconstitutional in August 2017 by 3:2 majority of an SC Constitutional Bench, with the majority judgement ruling that Triple Talaq was not ‘integral to Islam’ and against ‘tenets of Holy Quran’. Note: the judgement was completely contingent on the judges understanding that instant triple talaq is not permitted as per the Quran – in fact, this medieval practise is even prohibited in hardline Islamic countries like Pakistan! The SC judgement also did not ban the non-instant form of triple talaq since, as the judges mentioned, it is very much part of the Quran. AIMPLB (All India Muslim Personal Law Board), which had argued in favor of Triple Talaq and claimed that if the practice is discontinued a man could murder or burn his wife alive to get rid of her, was represented by senior lawyer Kapil Sibal who argued that, “Testing the validity of customs and practices of a community is a slippery slope into which the Supreme Court must not venture.” Sibal also equated the issue of triple talaq with the belief that Bhagwan Rama was born in Ayodhya, arguing that these were matters of faith which cannot be put to test on grounds of constitutional morality. While passing its judgement, the SC asked the government to bring legislation in six months to govern marriage and divorce in the Muslim community. The Muslim Women (Protection of Rights on Marriage) Bill, 2017, which criminalizes the practice of instant triple talaq, was introduced by the NDA Government and the bill was passed in Lok Sabha in Dec 2017. The bill was opposed by Opposition parties, including Congress, in Rajya Sabha. In August this year, the NDA Government introduced certain amendments to the bill to accommodate the opposing viewpoints, but it still stuck in Rajya Sabha with Congress-led Opposition stalling its passage by demanding it be sent to a Select Committee for further ‘fine tuning’. One of the main demands of Congress and other ‘secular’ parties is that the three-year penal provision be removed as they claim it would ‘destroy Muslim families.’ But they have failed to explain how removing the penal provision, which is similar to the punishment under Dowry Prohibition Act, would create deterrence against instant Triple Talaq – even after the SC judgement banning the practise, at least 201 cases have been reported across the country, the Law Minister informed parliament recently.